The visit to Moscow this week by German President Frank-Walter Steinmeier heralds a growing rapprochement between the two countries. That’s not just good news for bilateral business ties. It is key to unlocking the dangerous East-West crisis. 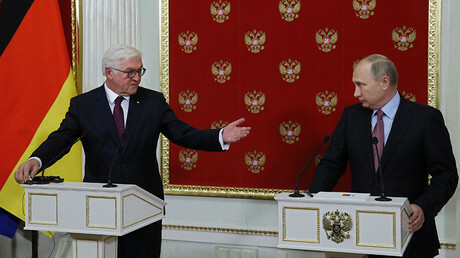 “I‘m convinced we need to resist the alienation that has grown up between our countries in recent years,” said Steinmeier at the talks with Russian President Vladimir Putin. The two leaders held wide-ranging discussions beyond narrow bilateral interests. Both reportedly exchanged views on “pressing global issues” including Syria, Ukraine, North Korea and Iran. Putin said of his meeting with Steinmeier: “I want to voice hope that your visit will help us to make a contribution to developing our bilateral relations and strengthening our interstate ties.” The German president’s role as head of state is largely ceremonial. Formally, he doesn’t have political power, which rests with the country’s chancellor, Angela Merkel. Nevertheless, the symbolism of Steinmeier’s visit to Moscow carries enormous significance. This week was the first visit to Russia by a German president since 2010. Steinmeier’s predecessor, Joachim Gauck who was in office from 2012 until this year, was renowned for having a “frosty” view of Russia. Under Steinmeier the relationship is not just thawing; it is warming rapidly. Previously, Steinmeier served as Germany’s foreign minister in the Social Democrat (SPD) coalition government with Merkel’s Christian Democrats. He worked with Moscow on forging the landmark 2015 Iran nuclear deal, and on trying to resolve the ongoing conflict in Ukraine through the Minsk peace accords. Thorny issues remain, said Steinmeier, over the Ukraine crisis and Crimea’s decision to join the Russian Federation, which the German president insisted on characterizing as “annexation” by Moscow. Still, there is a definite change underway due in no small part to Steinmeier’s evident willingness to engage Russia diplomatically. It was obvious from his public remarks that the German president has a keen sense of historic links between the two countries. Steinmeier’s urgency to restore bilateral relations is no doubt based on the two countries having battled during two world wars, “whose victims must remind us of the need to preserve peace,” he said. The sharp and protracted deterioration in East-West relations must be resolved through earnest dialogue, mutual understanding and diplomacy said Steinmeier. The Social Democrats are now an opposition party in the German Bundestag following recent elections. However, the party seems more in tune with the nation’s strategic interests when it comes to calling for an easing of Western economic sanctions against Russia. Despite those sanctions, German-Russian bilateral trade is booming again this year, recovering from a downturn due to the sanctions imposed in 2014 over the Ukraine conflict. Germany’s Chamber of Commerce is predicting 2017 to be a turning point in improving relations. There seems to be a growing awareness in Germany that the US-led new Cold War against Russia is harming German and Europe interests far more than American. Earlier this month, Gerhard Schroeder, the former SPD chancellor (1998-2005) delivered a scathing analysis of the fundamental divergence between Europe and the US. Schroeder told the Eurasian Economic Forum in Verona: “I see the United States is interested in a weaker Russia, [but] the interest of Europe and Germany is that Russia will prosper.” The former chancellor, who is now chairman at Russian oil major Rosneft, said there were two fundamental reasons why an economically strong Russia was important for Germany and Europe. “We need a [export] market, especially Germany, [and] we need resources for our industry,” he said. This strategic economic relationship is what lay behind the delegation of German business leaders to Sochi earlier this month where the head of Siemens and other companies met with President Putin to discuss future prospects. Political economist Peter Koenig, who previously worked as a senior analyst for the World Bank, says German industry increasingly realizes that future development depends on the country reorienting its economy toward Russia, China and the rest of Eurasia. The problem is that the Cold War-type deterioration in East-West relations is placing a major constraint on Germany’s economic prospects. That explains why German business delegations are lobbying for sanctions to be lifted. It also explains why politically in-tune President Steinmeier and former chancellor Schroeder are calling for an urgent re-set in bilateral relations between Berlin and Moscow. Chancellor Merkel is hawkish about keeping sanctions on Russia over the Ukraine dispute. However, even she will be feeling pressure from German industry to change tack. As she forms a coalition government with the pro-business Free Democrats, Merkel may find herself having to compromise on the sanctions issue. The other factor is the growing awareness in Germany, France, and the European Union that as US President Donald Trump pursues his “America First” policy, the Europeans are being made to pay a hefty price for their strategic interests. A new round of sanctions imposed on Russia earlier this year by the Trump administration took aim at European energy companies doing business with Gazprom and the Nord Stream 2 gas pipeline. That sparked anger in Berlin and other European capitals as an outrageous interference in EU affairs. Koenig warned, however, that Washington will try to scupper this global realignment. 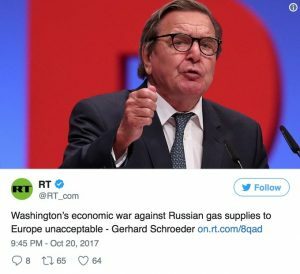 Another danger apart from the US using financial penalties is that Washington may step up political and military conflicts to thwart German and European interests growing with Russia and Eurasia. Watch out for US-led NATO expansion in the Baltic, Ukraine and the Balkans as a way to destabilize German-Russian relations. Grim echoes of history there. On that note, President Steinmeier’s push this week in Moscow to strengthen diplomatic ties with Russia takes on even more urgency. Steinmeier’s emphasis on Germany and Russia’s historic obligation to seek peace and prevent war could not be more timely or crucial.